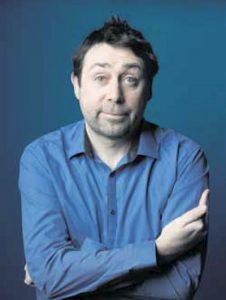 Sean Hughes is best known for being a team captain on the BBC’s hit quiz show Never Mind the Buzzcocks. He has toured up and down the country as well as abroad with his successful hilarious comedy stand up tours since then, along with a fortnightly podcast called Under The Radar where he has special guests from the world of comedy, sports and entertainment. His poetry collection is My Struggle to be Decent and he performs it with his unique brand of stand-up.